A few nights ago, I watched "Behind the Music" on VH1. 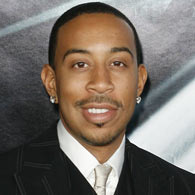 The episode featured Chris Bridges, better known by his stage name Ludacris. I was actually surprised that he had some depth. Then again, with lyrics like "you's a ho" and "I got hoes in different area codes", my expectations weren't too high to begin with...but I digress. Anyway, the reason why I'm even telling you about this is because as I watched it, I developed a mini crush on him. He is handsome, well-spoken, driven and lost his father prematurely (which is something I can relate to). My DVR must have gotten tired of recording the same shows over and over because I don't recall setting it to record this one. Either my cable box is possessed, or Ludacris and I were meant to be. On second thought, this is probably how psycho celebrity stalkers start out. Today I'm forming superficial connections with him. Tomorrow I'll be sending him love letters made completely out of magazine clippings and picking out potential baby names. I should probably get over my little crush while I'm still sane. Posted in Silly Stuff and tagged with Ludacris, fantasy, celebrity crush. August 25, 2013 by Veronica Dasher.